We love pie and we love mini pumpkins even more, so the fact that we didn’t think of combining the two sooner kinda blows us away. Seriously though, we’ve been decorating with tiny pumpkins as long as we can remember — who knew they make for the most adorable little dessert receptacle ever? You’re probably a little dumbfounded right now too, but it’s true. You can totally eat these, and we’re not sure there’s anything cuter or more perfect for fall than a pumpkin pie inside of a pumpkin. The best part about these (besides the cuteness factor) is they actually make a much better shell than pie crust does. There’s no spilling over the sides or burning edges to deal with. 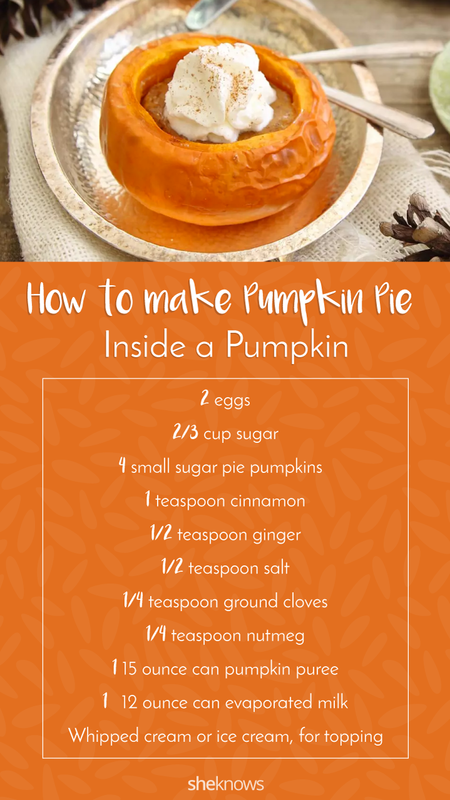 The pumpkin itself is perfectly cooked and soft by the time the filling sets in the oven, and you get a little slice of actual pumpkin with each bite. Plus, they’re the perfect portion control for pie. Win-win. 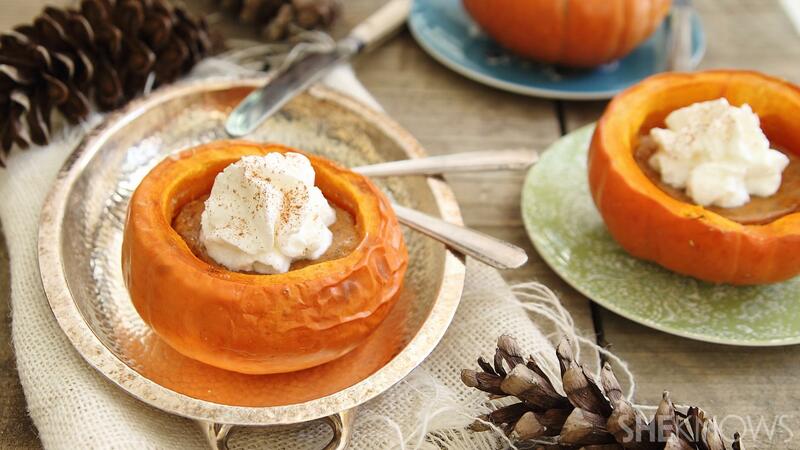 Pumpkin pie filling is poured into an actual mini pumpkin or squash and baked to perfection. With each forkful, you get a bite of pie and pumpkin. Cut a small slice off the bottoms of the pumpkins so they sit flat. Cut off about 1/3 of the top, and scoop out the seeds and flesh in the middle for the filling. In a small bowl, combine the sugar, spices and salt. In a large bowl, whisk the eggs. Add the pumpkin, and whisk until incorporated. Add the sugar and spice mixture, and mix again. Slowly add the evaporated milk, and stir until combined. Pour the filling into the hollowed pumpkins, leaving about 1/2 inch of space from the top so the filling has room to expand while baking. Place the pumpkins into a baking dish, and bake for about 60 minutes, until the pumpkins are cooked and the filling is mostly set. Remove the pumpkins from the oven, and let them sit until completely cooled. The filling will set more as it cools. Top with whipped cream or ice cream, and serve. The pumpkin itself is also edible!